If the site is looking wonked out for you, I apologize. We are in the middle of a bit of a coding crisis and the site doesn’t like to update instantly. Even when we get it fixed it can take a long time to update changes. I have no idea why, I just draw comics. It’s the first time Sockarang has been asked a question. Finally we know the truth about his socks. You may remember from Bad Guy Earth that Sockarang’s family was made into sock fighters by the president. You may think there is a continuity error here because Sockarang was actually altered into a sock hero when he was a child and this comic says that after he had been fighting crime for a month, his socks wore out but in the picture he is depicted as a grown man. The reason is obvious. He didn’t start actually fighting crime until he was a grown up. See? Water tight. 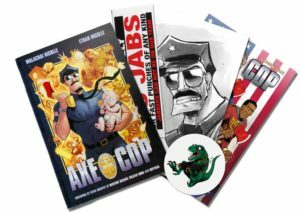 Next week’s Ask Axe Cop stars Morgan Freeman and is here if you want to join up and get your Axe Cop a week early fr $2/month. Have you started reading the new story? The Songster pages post on Thursdays. Here is the first page. Never read Bad Guy Earth you say? Shame! 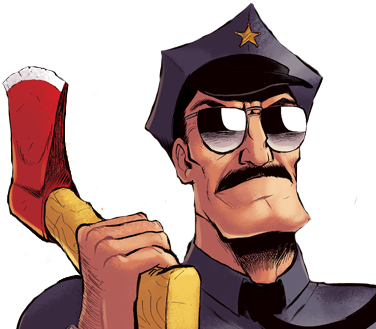 It’s my favorite complete Axe Cop story. It’s not on the web site, it’s a print exclusive story in book form. I recommend buying it from me in a headchopper bundle with goodies and original art thrown in. If you are new to my store use the code IMNEWHERE to get 17% off your first order. Get all 6 volumes or just one signed with bonus items.